High quality PCB easy to solder. 24 pin ATX connector (Digikey P/N WM21362-ND). newer ATX supplies! Where is the wire to connect the binding posts? None included? Okay quality binding post, not the worst I've seen but okay. Could use a picture of fuse clip orientation, it was confusing to my students. Items I changed from the original. no points taken for these items but may want to consider for next design. Used different colors for different voltages. 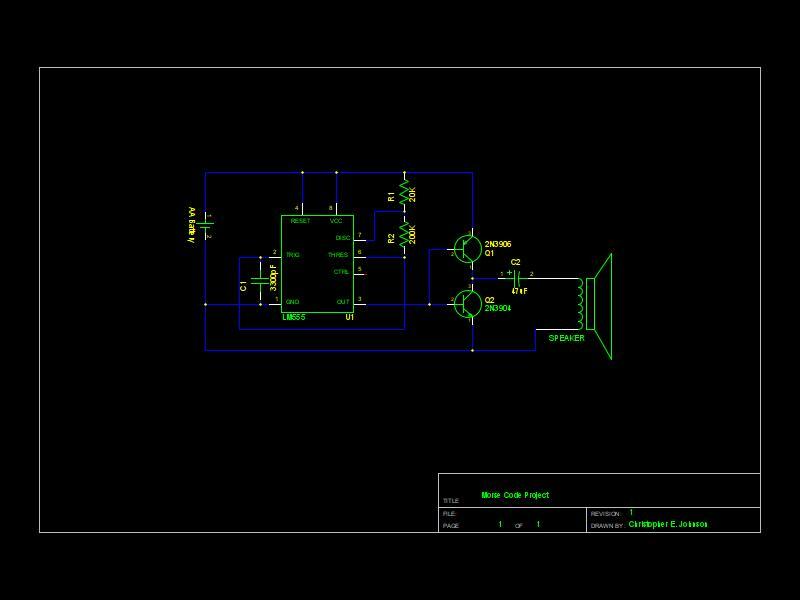 Stay tuned.....in the next few weeks when I redesign this and add some other features such as an adjustable plus and minis voltage using the LM317 and LM337. Also a redesign for a single sided PCB, this will make it easier for use to make with our T-Tech Milling machine. HEY BUILD A CW TRAINER! Here is a handy little project I designed and built. It's a spin off of the classic LM555 CW Oscillator. But wait N1IR!.....isn't that a AA battery in the circuit? Why yes! 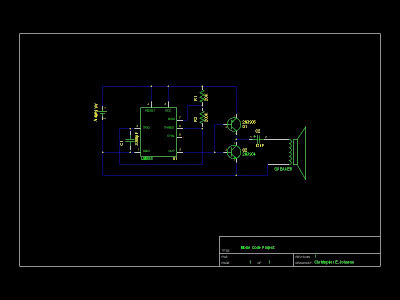 the LM555 minimum voltage is 4.5 Volts so I design this circuit with a TLC551 LinCMOS, this is a direct replacement of the LM555 but can operate as low as 1 Volt! 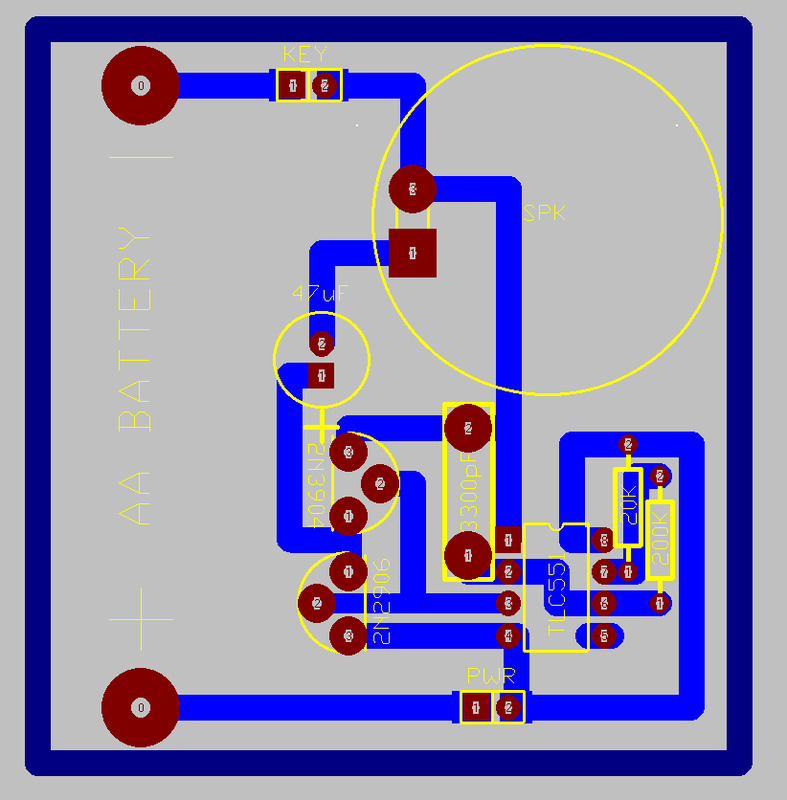 I chose this IC because the AA battery is less expensive and will last longer than a 9V and smaller foot print. What's with pin 3 connected directly to the base of the TLC551? I thought you needed current limitation of the transistors? Yes and no.....with the supply voltage so low and current limitation of the IC (1mA) you can get away with it, thus reducing parts count.....but if you want a higher voltage let's say 3 volts or more you will need a current limit resistor from pin3 to the base's. How do I change the battery? Well this is a prototype that was originally designed for one use disposal for a CW training class, the battery life is past 200 hours continuous use at 50% duty, far exceeding the class time. If you would like an easier battery replacement Radio Shack sells a AA battery holder you can solder in place of the current battery. Full production model may have a battery holder pending price. What connector is that connected to your key? I used a SIP connector I salvaged off a computer case, this again was to make this as inexpensive as I could. Will you sell me one for $5.74? NO!.....how about $10.00? NO!....How about $20.......NO! If you would like one please sign up for our upcoming CW class course at the Genesis Amateur Radio Club, they are a donation for students for our class only. Thanks Chris (my brother in law) for giving me his old NES system version 2. I had one years ago and missed it. I use to have a version 1 and sold it at a yard sale when I was a kid in the 90's and regretted it ever since. Now with all the info on the web I was able to do a couple of modifications, something I couldn't do or had no knowledge of all those years ago. This mod I did because of the 1 Hz flashing problem with some legit games here are some pics, the lock out was always a pain and caused lots of problems with start up. The Led is tied to +5V on the anode and has a 220 ohm (R5) connected to a 74HCU04AP, I looked up the data sheet on the "04" and the output can sink or source up to 20mA not a problem with the blue led (10mA) with some calculation I figured about 8mA was flow through the LED, fine for me it's still very bright and give a modern look.